There is plenty to do in Kurow and the Waitaki Valley. From horse treks, hill climbs, boating and fishing to river walks and skiing at Awakino Skifield - there's something for everyone. geological formations ie Elephant Rocks and Earthquakes, jet boating on the Waitaki River. The hydro lakes are the perfect setting for water sports, camping and fishing. The Lakes are a popular ride for cyclists. Visit our gallery for more great images of our area. To find out about upcoming events, click here. ‘Authentic, natural, and individual...’ Tripadvisor. We are a small personalised horse trekking business offering a unique riding experience to individuals and couples. Genuine cross country riding, great scenery and views that lend to an experience which is both memorable and hard to beat. Book an hour long trek - or go right through to a whole day. Some experience preferred and age limit applies. Kurow Museum is on the Main Street of Kurow at the back of the Information Centre. Do call in and visit. The Museum is open Monday to Friday 9am - 4pm. Entrance is FREE, but we would love a donation to keep our quirky rural museum running. Paterson’s Cottage, [originally known as Paterson’s Accommodation House], is an historic building situated near the Waimate-Hakataramea Highway in South Canterbury and on the property of Glenmac. This building is an excellent example of an early cob building with its walls and chimney built of clay, (probably from the cliff at the mouth of the nearby Penticotico Stream), chopped up tussock and shingle. 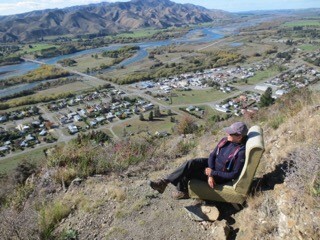 If you want to see the layout of the Waitaki Valley and Hakataramea Valley then Kurow Hill walk is a must. There are armchairs placed up the hill for rest and to take in the views. To get to the top of hill takes around 30 minutes with a few rests along the way. Access is from Grey Street, along from the Kurow Motels.